"There are besides in the city temples pompous with lofty roofs, conspicuous among them the Serapeum, which, though feeble words merely belittle it, yet is so adorned with extensive columned halls, with almost breathing statues, and a great number of other works of art, that next to the Capitolium, with which revered Rome elevates herself to eternity, the whole world beholds nothing more magnificent." The destruction of the Temple of Serapis (the Serapeum) at Alexandria is related in the ecclesiastical histories of the church fathers. Encouraged by the imperial edict addressed to the prefect of Rome prohibiting pagan worship (CTh. XVI.10.10), Theophilus, the patriarch of Alexandria, took the cult objects that had been found during the conversion of a pagan temple and contemptuously paraded them in the street, holding them up to ridicule. A riot was provoked and Christians killed. Just four months after promulgating his first edict in February AD 391, Theodosius I was obliged to reiterate the prohibition against pagan worship (CTh. XVI.10.11), this time in a rescript addressed to the prefect and military governor in Egypt. "employed in its execution a mixture of various materials. For he had filings of gold, and silver, and lead, and in addition, tin; and of Egyptian stones not one was wanting, and there were fragments of sapphire, and hematite, and emerald, and topaz. Having ground down and mixed together all these ingredients, he gave to the composition a blue colour, whence the darkish hue of the image." The disturbance was reported to the emperor, who declared the slain Christians to be martyrs. The defenders barricaded within were to be pardoned but the temple, itself, destroyed, so that, says Rufinus, "the cause of the evils and the roots of the discord which had taken up the defense of the idols should be eliminated, so that once these were done away with the reason for the conflict might disappear" (II.22). As the imperial rescript was read aloud and it became clear that the pagans were being held responsible, the Christians, shouting their joy, assailed the temple. They hesitated, however, to desecrate the figure of Serapis itself, fearful that, "if a human hand touched the statue, the earth would split open on the spot and crumble into the abyss, while the sky would crash down at once" (II.23). Then, at the instigation of Theophilus, one of the soldiers took an axe and struck the god on the jaw. Everyone cried out but, when the sky did not fall, the head was chopped off. Theodoret (Ecclesiastical History, V.22) relates that a horde of mice ran out from the hollow cavity, no doubt to the glee of the Christians. The rest of the huge idol was broken into pieces, the head carried through the town and the god burned in front of the sullen pagans who had worshiped him. Later, when the temple itself was being razed to the ground, Socrates relates that hieroglyphs in the shape of crosses were found incised in the stone. They were claimed by both sides, the pagans contending that "it symbolizes one thing to Christians and another to heathens." Busts of Serapis, which had been placed throughout the city, were destroyed and, boasts Rufinus, "In their place everyone painted the sign of the Lord's cross on doorposts, entrances, windows, walls, and columns." 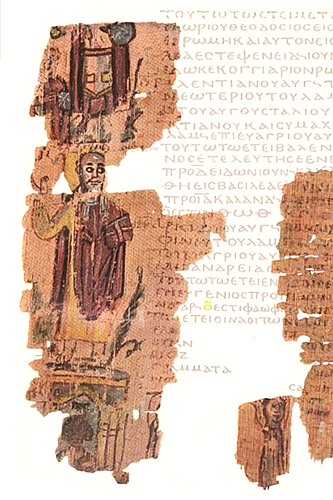 This fragment of papyrus, which is from The Alexandrian World Chronicle, shows the black face of the cult statue as described by Clement of Alexandria, with a modius atop its head. Standing triumphant above is Theophilus, gospel in hand, and what may be the sun-disk of Serapis raised aloft. The Temple of Serapis, which had stood for more than six centuries, was demolished, to be replaced by a martyr's shrine and a church. Theophilus then had the other temples in the city razed to the ground, "almost column by column." The images of the gods, records Socrates, were melted down to be made into pots and other utensils for the church, except for one statue of the god, which Theophilus spared as a reminder that such images ever had been worshiped (Ecclesiastical History, V.16). In his Lives of the Philosophers, the pagan poet Eunapius speaks of Antoninus, who had foretold the destruction of the Serapeum shortly before his death, when "the temples would become tombs." "For no sooner had he left the world of men than the cult of the temples in Alexandria and at the shrine of Serapis was scattered to the winds, and not only the ceremonies of the cult but the buildings as well, and everything happened as in the myths of the poets when the Giants gained the upper hand....this they accounted piety, to show contempt for things divine" (472). Later, the philosopher and mathematician Hypatia would be murdered by a Christian mob in an assault instigated by Cyril, the bishop's nephew and successor. With her death, the glory of Alexandria finally was extinguished. "...so rapid, yet so gentle, was the fall of Paganism, that only twenty-eight years after the death of Theodosius, the faint and minute vestiges were no longer visible to the eye of the legislator." And so it was. When Honorius and Theodosius issued one of their final edicts regarding pagans (CTh. 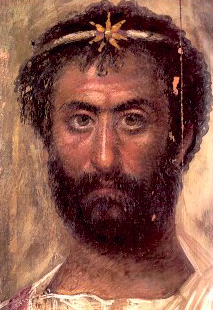 XVI.10.22) in AD 423, they felt obliged to remark that "We now believe that there are none." The ancient temples and those who had worshipped there were no more. The so-called "Fayum portraits," named after the oasis south of Cairo where the greatest number have been found, are extraordinary artifacts from the classical world. Painted on thin curved panels of lime wood in encaustic (melted wax in which pigment has been mixed, and applied with a brush or spatula) or less often in tempera on linen, these naturalistic portraits were placed over the face of the mummy's wrapped shroud. A unique art form, which flourished in Roman Egypt from the first to the third century AD, it combines the Greek tradition of painting with the Egyptian custom of mummifying the dead. This image was found at Hawara, the necropolis of Arsinoe, named after the sister and wife of Ptolemy II Philadelphus, and the most important site for Fayum portraits. It depicts a priest of Serapis, who can be recognized by the characteristic seven-pointed star on his diadem, as well as the three locks of hair below it. The portrait dates from early in the reign of Antoninus Pius (AD 138-61) and now is in the British Museum. A bibliographic note: Rufinus, in providing the first translation of the Ecclesiastical History of Eusebius into Latin, added two additional books, "partly from facts within my own memory; and these I have added to the previous books, like the two fishes to the loaves" (Preface), which continued the narrative to the death of Theodosius I in AD 395. Socrates Scholasticus, in turn, drew upon Rufinus in his own church history, which extended the account to AD 439. Adding further details, Sozomen drew upon them both, and was to have ended his history at the same date but closed instead with the death of Honorius in AD 423. Theodoret, the fourth church historian for this period, is less specific and ended his account at AD 429. A contemporary of Rufinus, Eunapius was a pagan sophist. 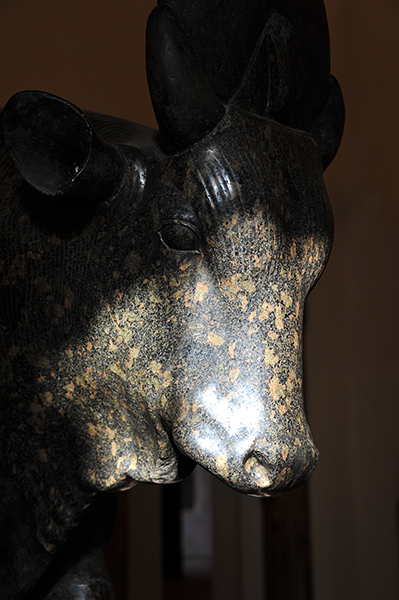 The massive black diorite statue, flecked with pink crystals, is of the bull-deity Apis, originally worshipped in Memphis and associated with the cult of Isis. In the shadows, one can discern the solar disc and sacred cobra between its horns. Now in the Palazzo Altemps (Rome), it dates to the second century BC and was found on the Esquiline Hill, where there was the Garden of Maecenas. It is from Apis that Ptolemy I Soter derived the name of the synthetic god Serapis, whose cult had become increasingly popular in Rome. The Historia Augusta is a collection of often spurious biographies of Roman emperors that was written in the late fourth century AD (about the time of Theodosius, when the Temple of Serapis was destroyed). Hadrian is purported to have addressed a letter from Egypt to his elderly brother-in-law Servianus, who was Roman consul in AD 134 (by which time Hadrian himself was back in Rome). In Alexandria, he relates: "There those who worship Serapis are, in fact, Christians, and those who call themselves bishops of Christ are, in fact, devotees of Serapis" (The Four Tyrants, VIII.1). References: Edward Gibbon: The History of the Decline and Fall of the Roman Empire (1995) edited by David Womersley (Penguin Classics); The Mysterious Fayum Portraits: Faces from Ancient Egypt (1995) by Euphrosyne Doxiadis; Ancient Faces: Mummy Portraits from Roman Egypt (1997) by Susan Walker and Morris Bierbrier; Theophilus of Alexandria (2007) by Norman Russell. The Roman History of Ammianus Marcellinus (Vol. II) (1940) translated by J. C. Rolfe; The Church History of Rufinus of Aquileia: Books 10 and 11 (1997) translated by Philip R. Amidon; A Select Library of Nicene and Post-Nicene Fathers of the Christian Church, Series II (Vol II: Socrates, Sozomen) (1890) edited by by Philip Schaff and Henry Wace; A Select Library of Nicene and Post-Nicene Fathers of the Christian Church, Series II (Vol III: Theodoret) (1892) edited by by Philip Schaff and Henry Wace; The Ante-Nicene Fathers: Translations of the Writings of the Fathers Down to A.D. 325 (Vol II: Clement of Alexandria) (1885) edited by Alexander Roberts and James Donaldson; The Chronicle of John, Bishop of Nikiu (1916) translated by R. H. Charles; Seven Books of History Against the Pagans: The Apology of Paulus Orosius (1936) translated by Irving Woodworth Raymond; Epiphanius' Treatise on Weights and Measures (1935) translated by James Elmer Dean; Philostratus and Eunapius: The Lives of the Sophists (1921) translated by Wilmer Cave Wright (Loeb Classical Library); The Theodosian Code and Novels and the Sirmondian Constitutions (1952) translated by Clyde Pharr; The Geography of Strabo (Vol. VIII) (1932) translated by H. L. Jones (Loeb Classical Library); Eine Alexandrinische Weltchronik (1905) by Adolf Bauer and Josef Strzygowski.